Monaco? I must be dreaming…. There’s a delicious irony about wandering the streets of a small town outside Monaco listening to Metronomy’s brilliant new album. I’m not sure there could be anything as far removed from the sun-drenched style and relaxed nature of Beaulieu-sur-Mer than The English Riviera, but the album’s title and music matches the landscape perfectly, and the pain of the 4.30am alarm call starts to melt away as I sit on the beach with a picnic, French style. A stick of freshly-baked bread, a small Camembert roule, and some cured ham. Oh, and a can of 1664. I am British after all. It’s a refreshingly inauspicious start, considering the real reason that I, and thousands of others, ranging from the local fans to the bejewelled yacht-dwelling, casino-patronising jet-setters, are here. 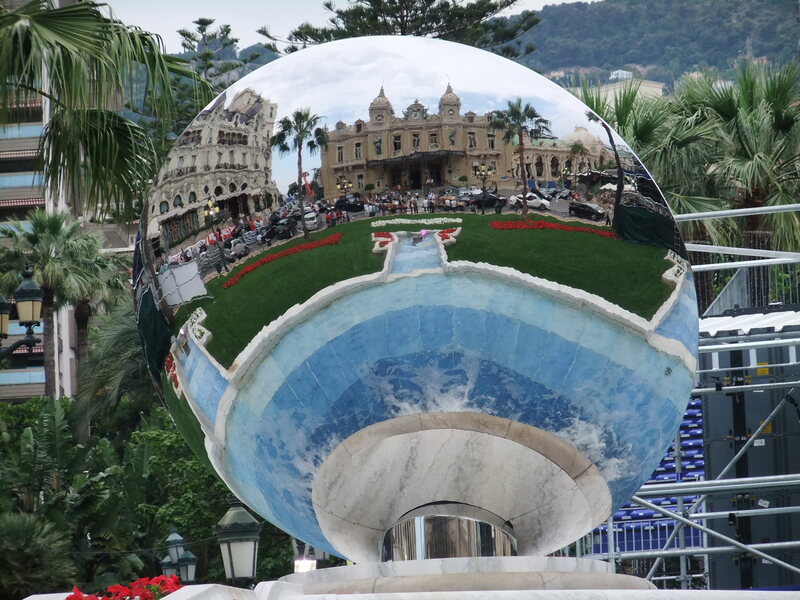 It’s Monaco, late May, and this can only mean one thing: The GP. Now, before anyone thinks I’ve suddenly transformed into some sort of nouveau-riche pretender, it’s not quite as glamorous as it sounds, or at least as high-rolling, and nor would I want it to be. I may be here on Grand Prix weekend, but it’s the GP2 I’m here to be immersed in, reuniting myself with the tooth-and-nail racing that thrilled me in 2007 in Bahrain and Valencia. The outgoing GP2 champion that year was a certain Louis Hamilton, and the likes of Nico Rosberg, Bruno Senna, Vitaly Petrov and Kamui Kobayashi were racing that year. You see, this may be F1’s feeder series (and in the last 5 years it’s given GP fans Hamilton, Kovaleinen, Senna, Di Grassi, Hulkenberg, Kobayashi, Glock, Perez, Buemi, and Maldonado amongst others) but this where the REAL racing happens. No DRS, no KERS, no steering wheels that look like 5 Sega controllers stitched together. This is 20-odd broadly similar cars, going at it hammer and tongs to see who really is the quickest guy out there. No Ferrari-sized budgets or drinks manufacturers bankrolling things. And thats’ why I love it. 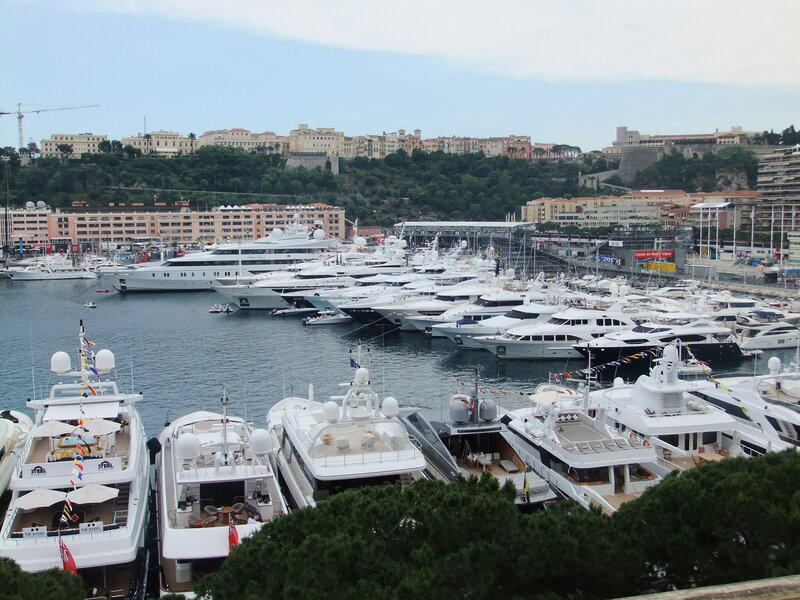 But this is Monaco, something else entirely. I’ve been watching this place all my life, from first seeing the washed-out colours of the Malboro McClarens and JPS Renaults back in the 80s, the days of Piquet, Prost, Senna, Mansell (actually, it should just be Senna and Prost, because no one else won it for a decade back then astonishingly) and getting to know the mythical twists, turns, corners, and of course the Casino Square, the Swimming Pool, Rascasse, it’s not any GP track, it’s probably the most famous in the history of the sport. Which is why Im already giddy with excitement, and I’ve not even set foot in Monaco yet. In around 45 minutes, I’m hoping to be stood by St Devote. It’ll be like the first time I went to New York, staring wide-eyed at Times Square. It’ll be like I’m on the set of a film. In short, it’ll be incredible. But tomorrow, I’ll be seeing racing, in the thick of it in the GP2 paddock. And then it’ll sink in, or maybe it won’t. Well. Wow. Just wow. Nothing really prepares you for being in Monaco the first time. Everything is so familiar, yet, everything is also so new. You know the corners so well – Rascasses, St Devote, Casino, Piscine – but seeing them in the flesh makes the hairs on the back of the neck stand up. It may still only be Wednesday, which means no racing, but the added bonus of this is that you can walk the length of the track and experience the feeling of being on that famous circuit, something you only get on race days in the evening. And yes I hear you say, you can do that all year round, but there’s no Armco, no sponsor’s logos, no fencing, no marshals, mechanics or drivers here then. The circus is only in town one week every year. Being in Monaco right now makes you feel instantly that you’re part of the action. I’ve been lucky enough to experience Bahrain and Valencia, but the out-of-town circuits are just that. Often the same razzmatazz, but outside the circuit, there’s little else on show. This is slap bang in the middle of a city, one that’s already bustling and brimming with buildings perched on hills and waterfront, and in fact, looking at the finishing touches being put in place, it’s a wonder that they manage to fit everything in here. The space is tiny, but yet somehow it all gets squeezed in. How the motor homes and trucks fit down the roads is beyond me. You’d need a slide rule just to get into the place. After 90 minutes wandering around open-mouthed I hook up with Will. He’s a veteran (at 30, sickening isn’t it?) 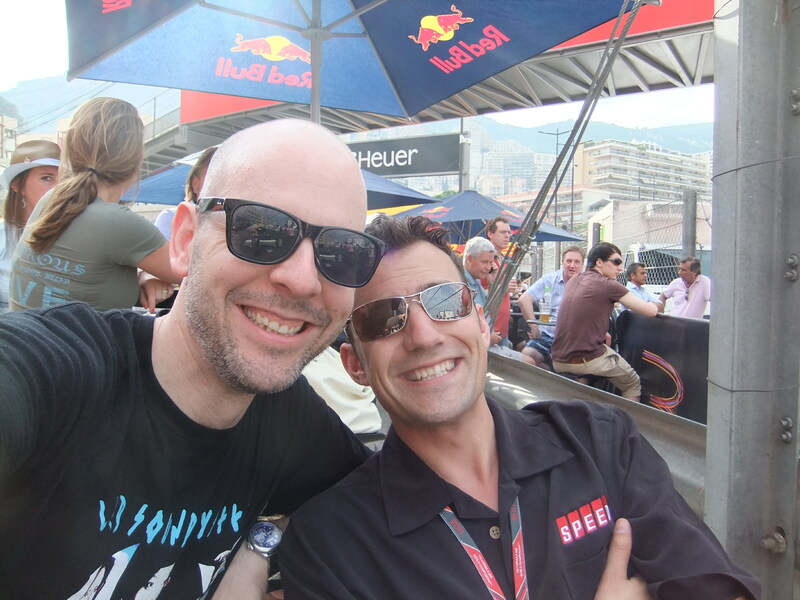 of GP2, F1 magazine, GPWeek, and now Speed TV, covering the races on the grid for the US Network. I don’t’ think I’ve ever met a more enthusiastic man and when you add his passion – F1 – to this, it’s almost off the scale. The thing is, while he’s such a fan, he’s also a consummate pro, talking casually about his job when it would make most of us mere F1 nuts weak at the knees. He’s been interviewing Lewis Hamilton one-to-one today, and yet asking for a run-down of his weekend so far is like water off a duck’s back (if he’s not going over his experience at the Mille Miglia of course). Shooting the breeze over a few crisp lagers at Rascasse (it may be expensive, but it’s not eye-wateringly Ibiza expensive, so it’s less of a shock to me than to some that find two ‘pints’ of Carlsberg setting them back 14 euros) and watching the Monaco people flit by with him is an experience in itself. Whether it’s the mechanics or PRs from the teams, taking a well-earned rest, or the fans, or the jet-setters (self-appointed in some cases, clearly, and hilariously), or the motley collection of ‘Miss Grand Prix’ girls that are being pawed over by various males – though i’m really not sure why in this case, when most of them appear to have taken a morning swim in foundation – it’s a menagerie on show, and defies sensible description. Every wants to see, be seen, be the centre of attention, and watching them vie for it is witheringly enjoyable for someone with a dry sense of humour. It’s a worthy sideshow to the race itself. Six beers in, and some chat with some of Will’s many friends and acquaintances on the circuit (including some wonderful Ferrari girls who brighten up the evening immensely) it’s apparent that if we don’t get food down us then Thursday will be a bleak day of suffering, which is fine for me, but as Will’s working from the crack of dawn, I’m thinking of him, and also the fact he’s a bit of a lightweight in all honesty. We end up hoofing a chilli burger and fries in a sports bar down the road – Stars and Bars; think a sort of Euro Hard Rock Cafe that revolves around football, motor racing and cycling – and coincidence means soon seated next to us are Dani Clos and Alvaro Parente, teammates in Racing Engineering, and two of the nicest (and talented) drivers you’ll ever meet. I pretend not to be in awe, convinced I’m styling it out admirably, when it’s probably the Carlsberg doing the trick, while Will chats away on setup, tyres, Monaco’s own unique challenges, and I try to join in without putting my foot well and truly in my gob. To avoid this, I stare at the cycling memorabilia on the wall (Miguel Indurain’s bike, Tony Rominger’s various shirts, Johan Museeuw’s too – all legends and from the era that got me into cycling itself) and wonder how on earth I managed to get myself into such an incredible situation like this. While for many this is a job or an expensive regular hobby, for me to come to a city and a race like this is boy’s own stuff, and I’m going to be spending the weekend pinching myself every ten minutes just to check I’m actually here and not in some hugely satisfying dream. By this time it’s gone 10, and I’m trying to get home before the last train strands me in Monaco and I have to spend my life savings on a cab. David, who’s one of the dedicated and unsung GP2 team, and the reason I’m out here in the first place, has landed, and I’m attempting to get home to say hi and thank him. It doesn’t go to plan, I’ve missed my train, and need to get on the next before cabs are the only option. This won’t be a good option, because the prices here are beyond eye-watering (as I found out in Nice this morning), in fact I’m pretty sure if you look at a taxi for too long you’ll end up having to pay, so I say my goodbyes, and stagger off to the train leaving Will to ‘have one last one’ on the way home. Sounds like danger to me (it will prove to be). Having spared a tired David my presence, I fall through the door of my room and onto the bed a tired, lightly-drunk, extremely happy motor racing fan. This has been one of the most fun days I’ve ever had, and the racing’s not even started yet!